Using G Suite for Education (Google Apps) or G Suite for Work and need to demonstrate usage and impact? Statistics 24 provides unique reporting functionality to show what your users have been doing and for how long. For education leaders driving forward with online education it provides an audit for quality monitoring and funding purposes, and for business it enables colleagues and leaders to demonstrate value and control in how Google Apps for Work has been used. Up to now the only reason not to use Google Apps for Education to deliver online learning was it’s lack of reporting functionality. Statistics 24 solves that in one easy click, providing quality managers, auditors and those responsible for funding with a clear audit trail of what users have been doing in Google Classroom and also for how long. This matters because independent online learning time can now be quantified. For teachers it provides unprecedented insight into what learners have been working on and for how long, no matter where they are or what kit they are using. If your organisation charges customers for your time, or you just need to keep track of who has been working on documents and for how long, Statistics 24 is the solution. Statistics 24 works exclusively with G Suite and best with the Chrome browser. The FREE plugin can be installed on Chromebooks and the Chrome browser for Windows and Mac. By installing the tiny plugin/extension on all of the machines in your organisation you can ensure that all work is automatically tracked. You can even install it on Chromebooks and PC's at home for distance or remote workers, for example. In order to access the reports and data there is a license fee for your organisation. 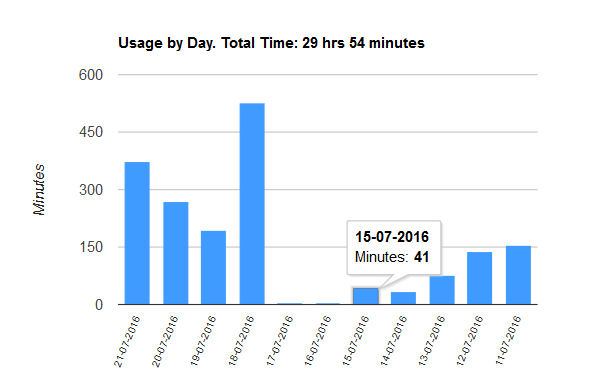 The plugin provides an instant way for users to check how much time they have spent using Google Apps over the past 7 days, and what times of day they were used by simply clicking the little icon in the corner of their browser. They can also use the full reporting site to see in-depth information over much longer periods, graphs and even export data to create their own reports if desired in spreadsheet applications. The same goes for anyone set up as an 'Organisation Reporter', but they can also access reports for anyone and anything within their organisation - not just their own data. The use of Google Docs, Google Sheets, Google Slides and Google Classroom is all logged as these are where most work takes place. As the Statistics 24 user base grows we are commited to expanding its features and adding more functionality. With this in mind we have recently added some weekly reports for organisations that include the following graphs. 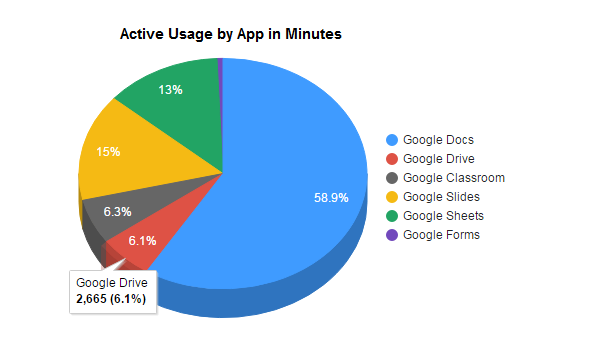 See how many sessions took place for different device types. Useful for making purchasing decisions based on existing Chromebook usage compared to Windows PC's etc. Help plan computer usage timetables by knowing when your busiest periods are. See how much work is being done outside of normal hours. See how many long or short working sessions take place. This can be a good indicator to show if people aren't taking adequate breaks or aren't managing their time well. Discover how many of your students/employees are actively using G Suite each day. Helpful to see if your resources are over or under utilised. Statistics24 was founded by Neil King and Jamie E Smith. Neil King - Coding and technical stuff. Software engineer, games designer, and an active player in the IT industry for decades. Applications creator for multiple sectors including education, automotive, child safety, medical and gaming. Generally regarded as a technical wizard. Jamie Smith - All things business related. Experienced education leader at board level with commercial sector expertise. TEDx speaker ‘Education in the Digital Age’, author of ‘Making Money from Stocks and Shares’, Fellow of the Royal Society of Arts, blogger and lifelong supporter of Unicef. Believes passionately that education is the only solution to all of the world’s problems and huge fan of all things Googley. Please let us know how you get on with the extension so we can improve and update it. Note: Windows 10 Anniversary Update / Creators Update must be installed. This includes Microsoft Edge version 40 or above. Ensure you are using the most up-to-date versions of Chrome, Firefox or Microsoft Edge. We recommend using the Google Chrome browser for the best experience. Your organisation will need a subscription for you to access the reports. Click here to view the changelog for the extension/plugin. First launch of the extension for MS Edge available on the Windows Store for Windows 10 users. Efficiency improvements with more processing delayed until absolutely necessary. The extension lies dormant if there is nothing to process. Authentication testing is now done at data transmission time with better error checking and less chance of permission requests being repeated. Bugfix for users who log into Chrome as one user and Google as another user to prevent confusion with authentication tokens. Bugfix due to new permission request needed from Google authentication. Removed the need for Chrome login completely. It now purely uses Google login instead. Drastically improved the number of web requests necessary making it much more efficient. Added checks for browser closing to prevent any loss of data (however small). Included new feature to support distributed servers for future expansion. Popup graph improved to use HTML5 canvas. Removed the need for Chrome login as Firefox doesn't support it. Improved resource efficiency so less web requests are needed. First proper release for large scale testing. Organisation licensing for Statistics 24 is available through C-Learning. Contact them below for a quote or a FREE trial. If you would like a free trial or pricing information, please contact C-Learning. You can register your interest in Statistics 24 by joining our mailing list and we will keep you up-to-date periodically with information and news. Don't worry - you can unsubscribe easily at any time.